Where does the time go?! Nu-Perspective, home of the revamps and updates of various underdeveloped, underutilized and all-but-forgotten Nubian (black) characters specifically, is back. We aim to showcase characters in fresh, contemporary and exciting ways both visually and story-wise. And this week’s guest is none other DC comic’s TYROC!!! Just for giggles, be sure to Google his original look and story, and let us know if you like what we did with him. Then see ya in 2 weeks with another Nu-Perspective. Story: Marzal Island is a separatist colony of Earthlings of African descent, who centuries ago isolated themselves from the rest of the world in a pocket dimension out of sync with reality. With the rise of the United Planets, a noble effort to bring solidarity between all races and species across known space, Marzal sent one of its champions as their ambassador, Troy Stewart. 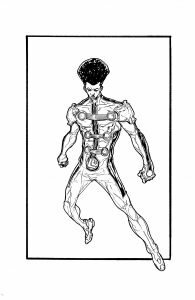 Enrolled in the prestigious Legion of Superheroes, Troy adopted the codename “Tyroc” which in Marzal means “Scream of the Devil” due to his exceptional acoustic powers. Despite his prejudicial upbringing, Troy is emboldened by the Legion’s creed and learns to work side-by-side with non-Marzalian humans and even extraterrestrials. His years of valiant service proved Tyroc to be a formidable member and capable leader. Eventually, however, the prejudicial shortcomings and the political and judiciary restraints on the Legion became begrudgingly apparent. 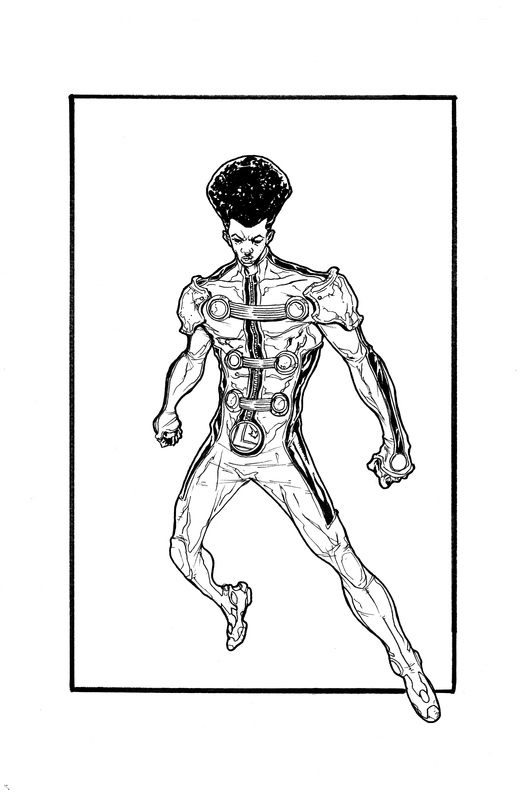 Tyroc recently returned from the 21st century on a secret suicide mission and approached Brainiac 5 for a solution to exact justice across the known cosmos without tarnishing the Legion’s reputation. With Brainiac’s blessings, Troy enlists some of his most trusted Legionnaires to create a special task force to deal with threats too dirty for Legion hands known as R.E.B.E.L.S. POWERS/ABILITIES: Tyroc possesses uncanny acoustic-kinesis, on an unparalleled scale. His power’s most common usage is a powerful shriek of concussive sonic energy that can level buildings, disorient or even incapacitate foes. However, Tyroc can manipulate his sounds to manifest, among other things, pyrokinesis, teleportation, psychokinesis, aerokinesis and weather manipulation. Another auxiliary ability includes a sonar sense. His mastery over his power is so precise that he can to “spit” a puff of wind like a bullet, and manipulate ultra and infrasound to subtly influence those around him or liquefy solid matter. He can also inadvertently use this power as a means of self-propelled flight. Tyroc is in peak physical condition and has undergone training with the Karate Kid. With his body having greater enhanced stamina and lung capacity than a normal human, and reinforced inner-ear tissues.